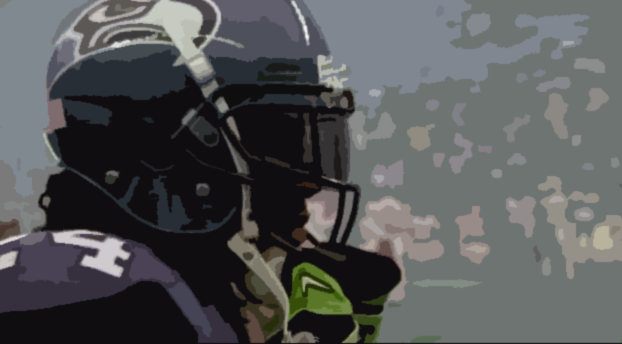 Here we list the Top 20 RBs who will be playing this Sunday and Monday. Please note, these are not our rankings. 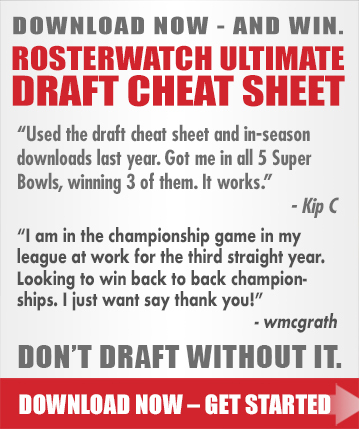 Our rankings can be found on the front page of RosterWatch.com in the FantasyPros.com Player Ranker. This tool serves as a graphic representation of fantasy RB performance over recent years historically. It compares the differences in fantasy output in home vs. away situations, indoor vs. outdoor situations and division opponent vs. non-division opponent situations. Players who would generally be ranked among this group who were left out due to lack of any significant historical data upon which to reflect in making our Week 12 roster decisions are Jalen Parmalee, Jacksonville Jaguars, Vick Ballard, Indianapolis Colts, Bryce Brown, Philadelphia Eagles, C.J. Spiller, Buffalo Bills and Marcel Reece, Oakland Raiders. Every player listed above represents a Top 20-25 play this week, but the situations they are in are very new and different from what previous numbers may indicate. For rookies like Trent Richardson and Doug Martin, we obviously only have this first year of data to look at, but at least their situations are much less dynamic and more settled in nature. For the veteran runners, I have looked back three years for those who have attained that tenure, but could obviously only look at 2011 and 2012 for second-year RBs. 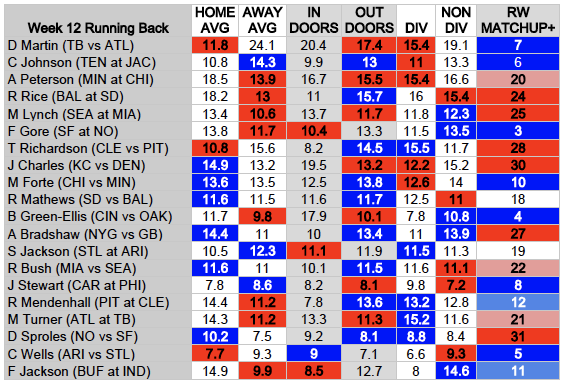 The situation each RB is facing Week 11 is highlighted in either red or blue. Blue represents the fantasy output having been better on average during this span than the alternative. Red represents the opposite. The “RW Matchup” cell on the right indicates the ranking our proprietary formula has assigned to that runner’s matchup for Week 12 in order to further aid in the evaluating the situation your fantasy runners face.